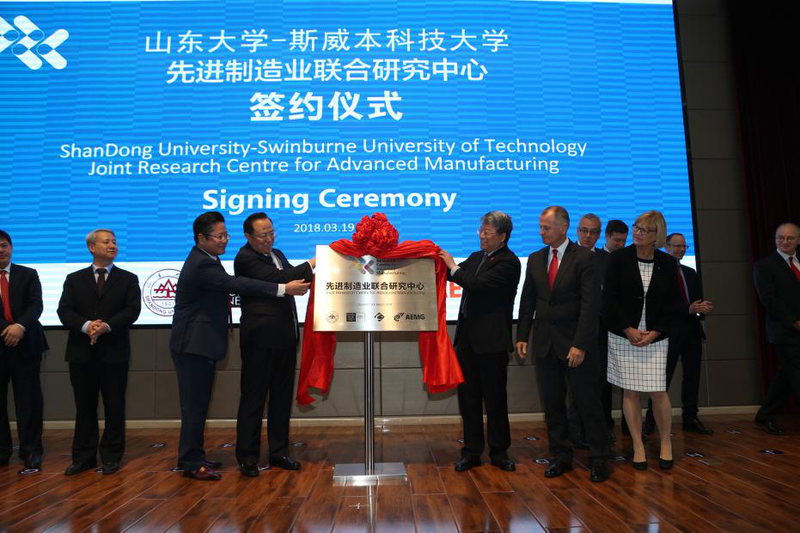 Accompanied by Mr. Roger LI, CEO of AEMG, a delegation from Swinburne University of Technology led by Prof. Linda Kristjanson, President and Vice Chancellor of SUT visited Shandong University, Weihai and participated in the launch ceremony held in Weihai International Port Economic and Technological Zone for the Joint Research Center for Advanced Manufacturing between Shandong University and Swinburne University of Technology. 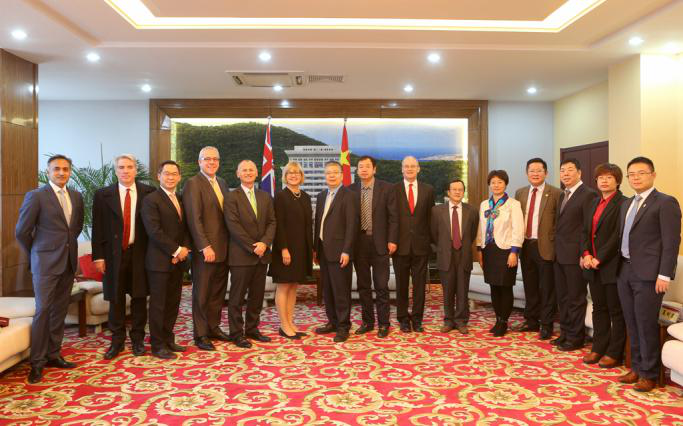 On March 18th, Prof. Linda Kristjanson, President and Vice Chancellor of SUT, Prof. Subic Aleks, Deputy Vice Chancellor (Research & Development) of SUT, Mr. Dan Tebbutt, Australia’s Senior Trade Commissioner for North China executive, Mr.Tim Dillon, Victoria’s Commissioner to China, Mr. Gerry Wilson, Research Director of Industrial Innovation of CSIRO visited the Weihai campus of Shandong University. In the afternoon of 18th, Prof. Liu Jianya, President of Shandong University,Weihai met with the delegation. The two sides discussed the basic situation of the construction of JRC and enrollment of PhD students. On March 19th, the launch ceremony of Joint Research Center for advanced manufacturing was held in Weihai International Port Economic and Technological Zone. In the ceremony, Vice Mayor of Weihai city, Mr. Zhang Wei, Director of Shandong foreign experts Bureau, Mr. Zhang Zhuxiu, Commissioner, Greater China, State Government of Victoria, Australia, Mr. Tim Dillon, Australia’s Senior Trade Commissioner for North China executive, Mr. Dan Tebbutt, President of SDUW, Prof. Liu Jianya, President and Vice Chancellor of SUT, Prof. Linda Kristjanson, CEO of AEMG, Mr. Roger Li gave speeches. Prof. Guo Xinli, Secretary of the Party Committee of Shandong University, Mr. Gao Xuguang, Chairman of the CPPCC of Weihai City, Prof. Aleksandar Subic, Deputy Vice Chancellor (Research & Development), Swinburne University of Technology and Roger Li, CEO of Australia Education Management Group (AEMG) jointly did the plaque unveiling .